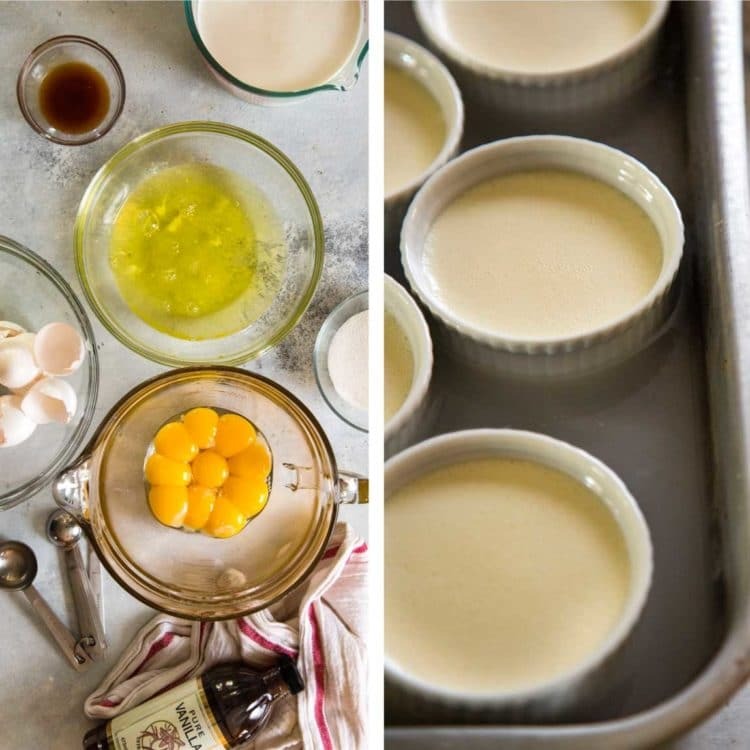 With the holidays around the corner I thought I’d share How to Make Creme Brulee. It’s not a flan or a pudding, it’s a rich custard topped with a hard caramel. The fun part in reaching that thick vanilla custard is breaking through that hard caramel topping! 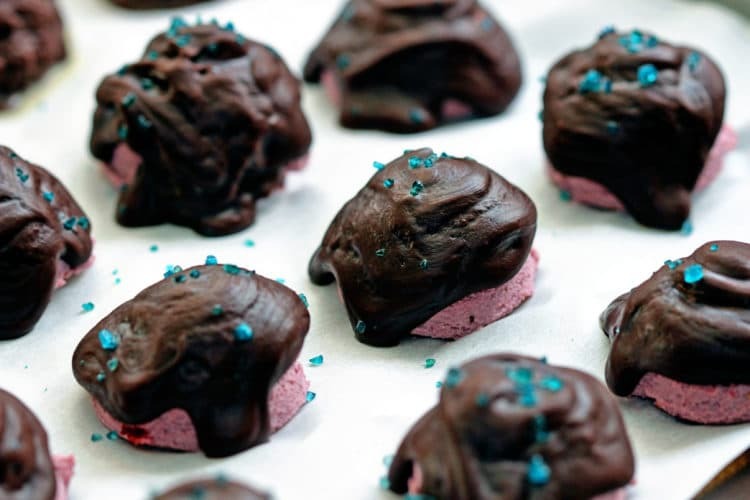 Some people would think this to be a difficult dessert to make, but it is seriously easy with minimal ingredients and hands down is one of my top 5 desserts. And this is coming from a tried and true chocoholic. It’s not a flan or a pudding, but a rich vanilla flavored custard topped with a hard caramel. What is in Creme Brulee? It’s pretty simple and the ingredients are heavy cream, eggs, vanilla and sugar. That’s it and there is no tempering of the cream and eggs with this recipe! 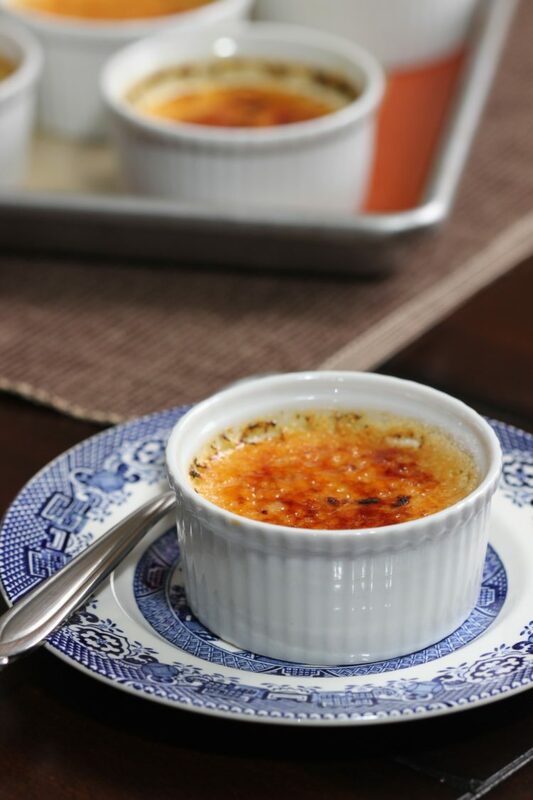 My Creme Brulee is extremely easy to make, is super rich in texture and is such an amazingly delicious dessert. 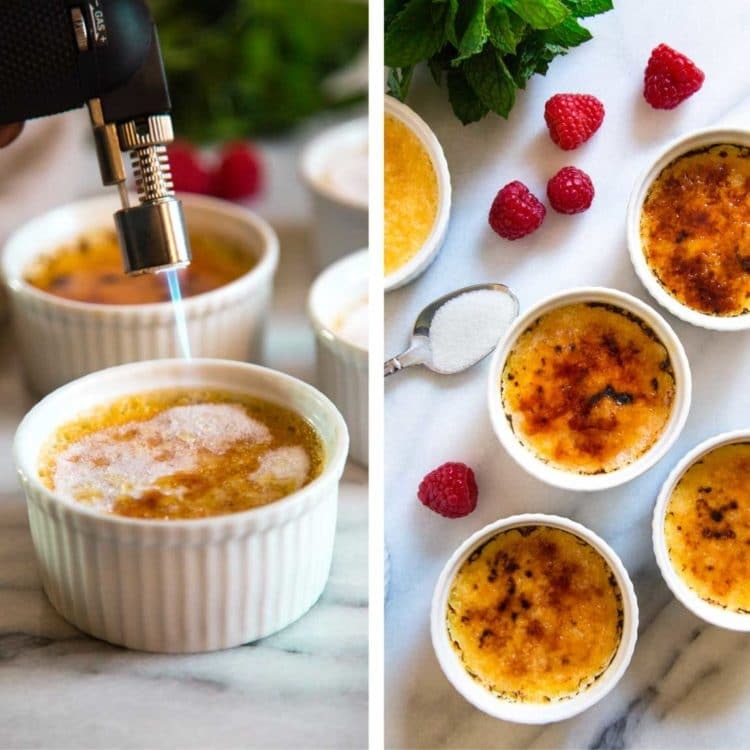 Creme Brulee is a classic French recipe with four simple ingredients. I have experimented with adding cinnamon or other flavorings in lieu of the vanilla to the liquid mixture prior to baking, but the vanilla is still the classic king. Let me show you how to make creme brulee and see that there is no big mystery or special tools needed. If you don’t have a hand kitchen torch, you can place the entire tray of the ramekins under the broiler and watch the sugar caramelize. 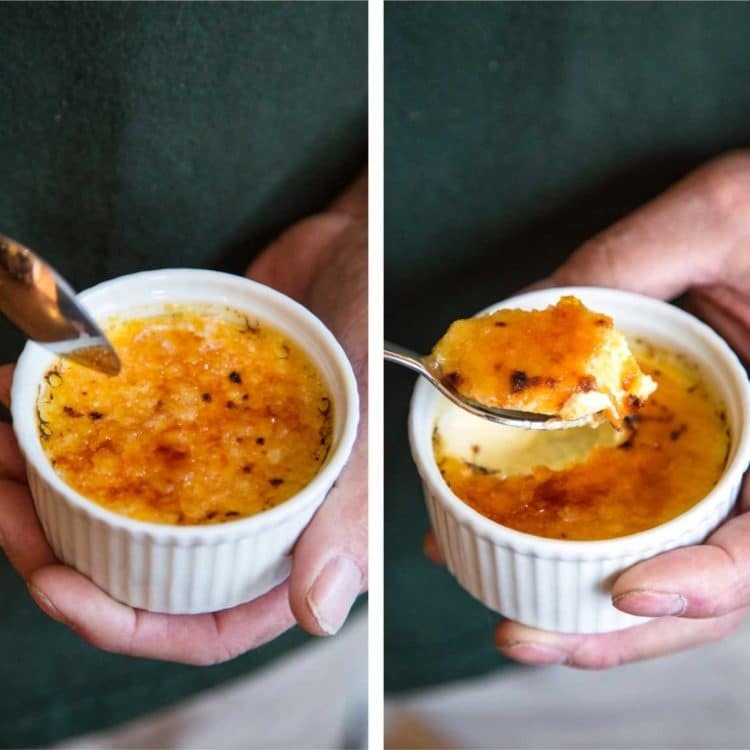 That’s what the French term “brulee” comes from and the recipe name basically translates to burned cream. 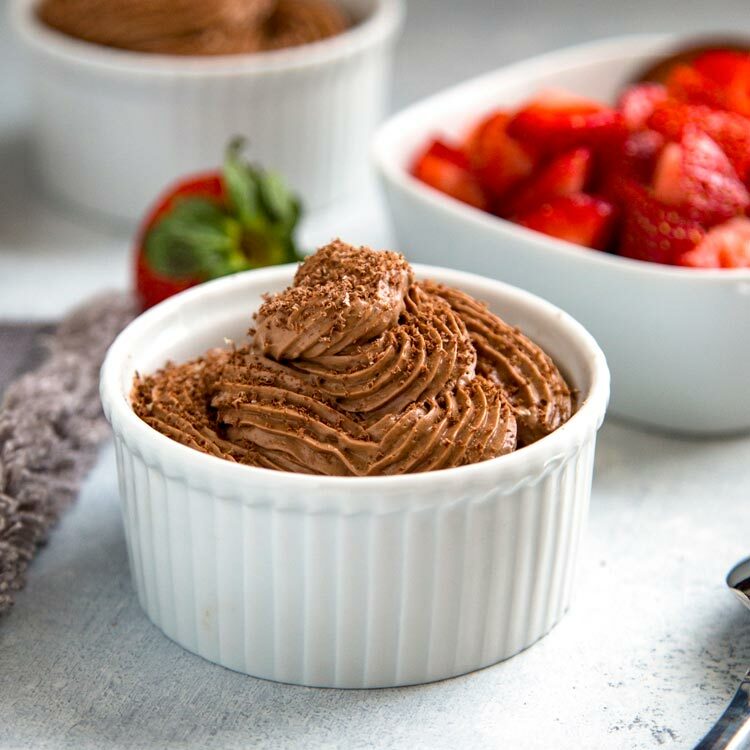 If you like French desserts like this, try my Chocolate Creme Brulee, Cinnamon Creme Brulee, or one of my all time favorite desserts, Piret’s Chocolate Mousse. Enjoy! Below is a video to show you how to make creme brulee. It’s easier than you think! 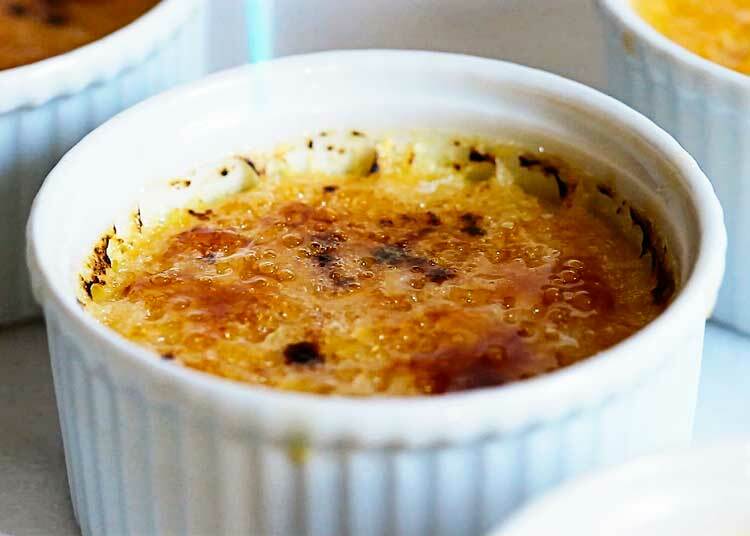 Creme Brulee is a classic French dessert with a rich custard topped with a hard layer of caramel. 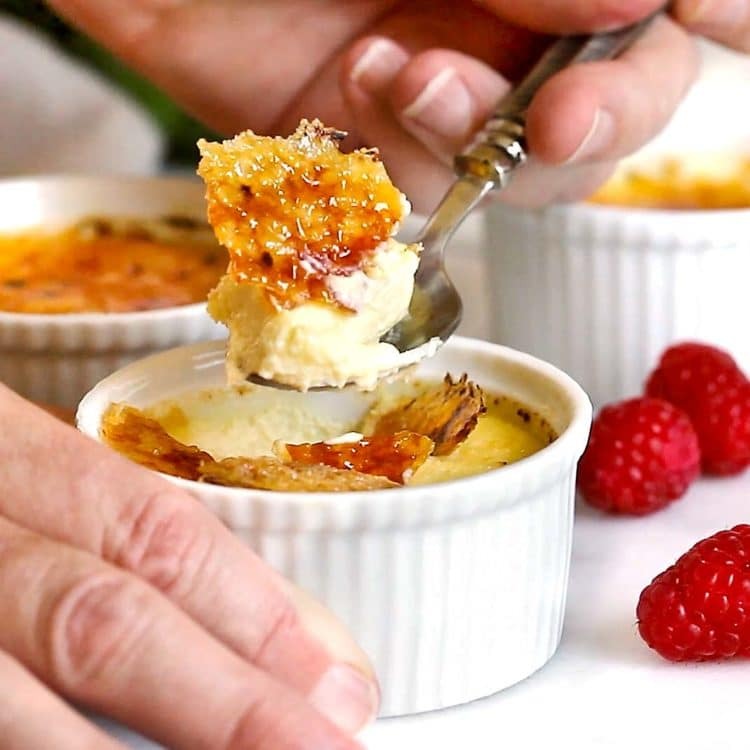 I'll show you how to make Creme Brulee with 4 ingredients. Preheat oven 300°F. Separate egg yolks from whites and save egg whites for another use. In a large mixing bowl, beat together the egg yolks with the sugar until the sugar is dissolved and the mixture is a pale yellow. Add the whipping cream and vanilla, and beat on low until well blended. I pour the mixture through a strainer into your 8 ramekins (See Note 1) or custard cups to get rid of any foam or bubbles (See Note 2). Pour up to a 1/4 inch from top of ramekin or cup. Place the filled ramekins into a large roasting pan with sides (13x9") and carefully pour hot water around ramekins so that the water almost reaches the top of ramekins. Bake until set, about 50 minutes. Carefully remove pan from oven and leave in the water bath until cooled. Remove ramekins from water bath, wipe water off and place in refrigerator to chill for at least 2 hours. The size I use here are 3 1/4" in diameter, 1 1/4" deep and hold roughly a 1/2 cup. I find pouring through a strainer eliminates any foam and leaves a smooth surface. This is purely optional. If not serving right away, do not do the sugar topping part. Cover with plastic wrap and refrigerate up to 2 days. Top with sugar and torch/broil before serving. It will not stay completely hard if done more than 3 hours prior. I made this recipe a few days ago and it came out perfect. All my guests enjoyed it. The custard was perfect-rich and creamy. I was asked to make sure I make it again the next time everyone attends a holiday meal. I made sure I beat the egg yolks and sugar until a light yellow and mixed the the whipped cream into the mixture on a low speed of my mixer. I followed the recipe exactly. Thank you for a great easy recipe. So happy you and your guests enjoyed this Esther! 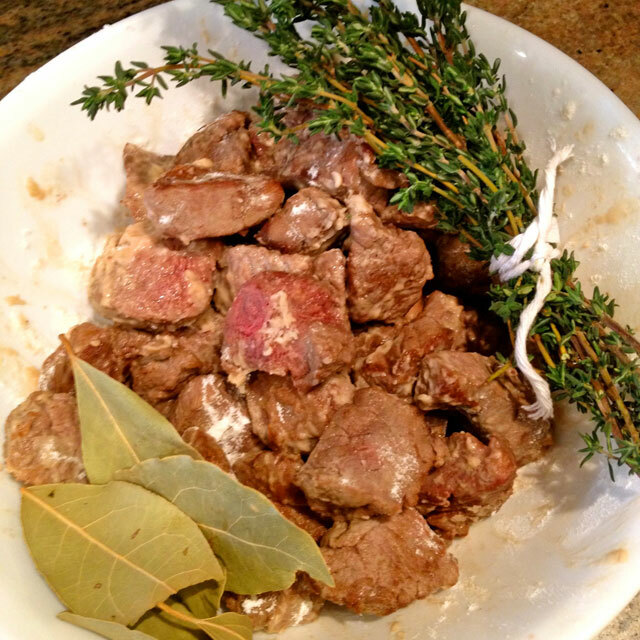 I can’t fairly rate the recipe since I’m making it today… but I’ll come back. But it seems too easy to be true!! I was hoping you could share some recipie ideas for the remaining egg whites? I’ve got chickens laying a dozen or more a day and am thrilled to use them up for more than breakfast! I’m wondering that myself. You used large eggs, heavy cream? Did you fill the water bath up to at least half of the ramekins? This is one consistent and super easy recipe. Creamy and custard like every time. I have no idea what Jamie is talking about below. 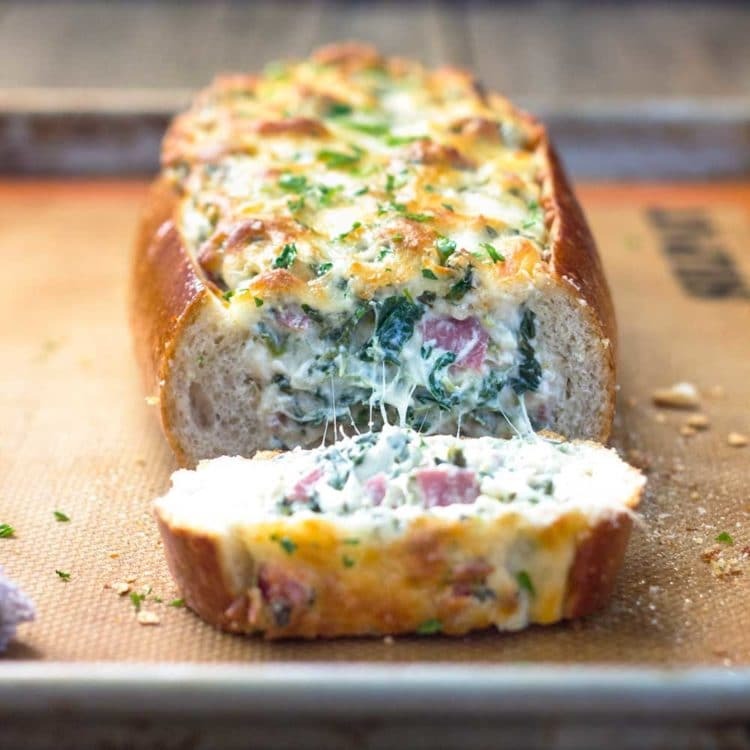 We made this a third time last night and it’s always a hit! I don’t know either Dave. It is one of my all time favorites and I’ve never had the issue Jamie mentioned. Thanks for taking the time to come back and let me know! Probably the worst creme brûlée I’ve made or had. Should of known by the 55 mins baking it would turn into egg yolks baked. Last time I did creme brûlée I had to temper it then pour into the dish and bake for a short period of time. Jamie, you’re a first! Sorry that was you experience. Can I expect poor results if I’m too impatient to let the eggs and cream come to room temp? Also, what would the measurements be if I wanted to half this recipe? Thanks! Run eggs under hot water for a few minutes. You could do the same with the cream. 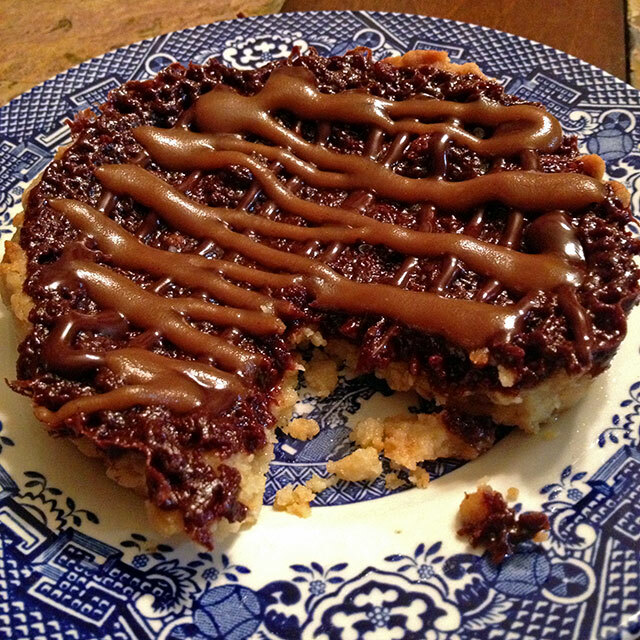 Have you ever tried baking this in a convection oven? We recently moved and I’m having problems with this oven. Help! No, it’s not sadly. A creamy custard like texture is what you’re looking for. Not exactly sure what you did that could alter that. Was there enough water in the pan when baking? Couldn’t wait til they were completely cool. My husband took 2 out of the refrigerator, sprinkled on the sugar and browned them w a kitchen torch. We ate them in record time! Absolutely delicious!!! Tasted just like the one we order at our favorite restaurant!! 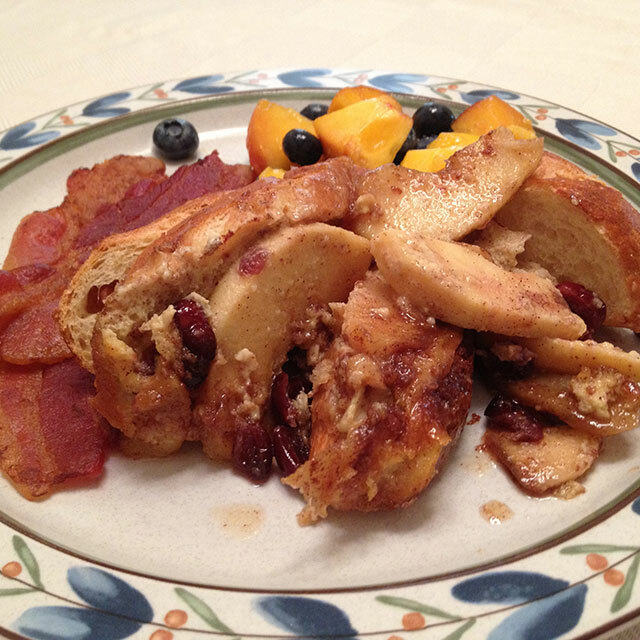 This recipe is a delicious and easy keeper! Thank you!!! 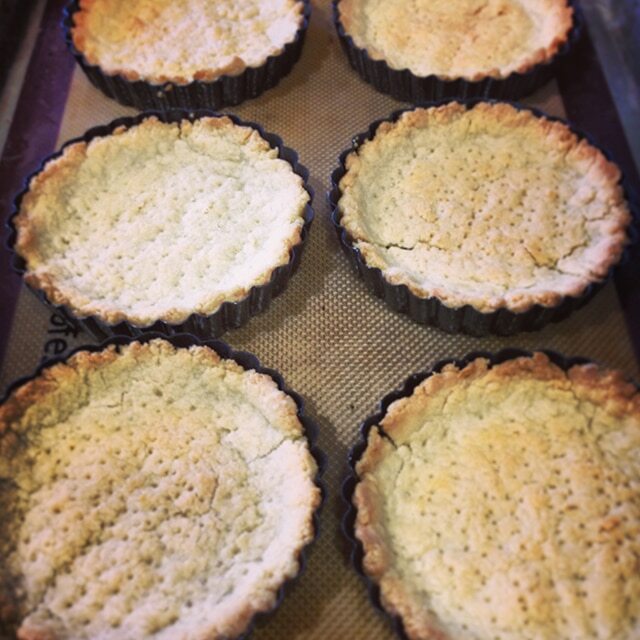 They are in the oven now…can’t wait! The recipe was easy. I’ll let you know how they taste in a while!